Writing from Australia Ian Wilson will be familiar to Talkshop regulars expounding his interest in astronomical connections with earth. He has three related recent articles and now a summary binding them together. Tim adds, the subject has a long history including false accusations of astrology by detractors; in this linked 1999 paper by a veteran scientist some of the origins and history is briefly mentioned and also that as data and computing power becomes available progress is being made. It mentions El Nino [paper see ref 1]. Strangers may need to get a conceptual understanding of the regular alignment of the earth moon and sun, where self evident effect on earth is the cyclic variation is ocean tidal height. If you are unfamiliar with this topic you may wish to read the following three post in order to understand this current covering post. Impact Upon the Earth’s Length of Day (LOD). Observations of the Earth rate of spin (i.e. LOD) show that there are abrupt decreases in the Earth’s rotation rate of the order of a millisecond that take place roughly once every 13.7 days. These slow downs in spin occur whenever the oceanic (and atmospheric) tidal bulge is dragged across the Earth’s equator by the Moon. They are produced by the conservation of total angular momentum of the Earth, its oceans and its atmosphere. a) The lunar distance during its passage across the Earth’s Equator determined the size of the (13.7 day) peaks in LOD (i.e. the magnitude of the periodic slow-downs in the rate of the Earth’s rotation). These series of posts are based upon the premise that El Nino events are triggered by a mechanism that is related to the relative strength of consecutive peaks in the Earth’s LOD (corresponding to decreases in the Earth’s rotation rate) at the same point in the seasonal calendar . If this premise is valid then we should expect to see a pattern in the sequencing of El Nino events that matches that of the 31/62 year Perigee-Syzygy lunar tidal cycle. This particular long-term tidal cycle synchronizes the slow precession of the lunar line-of-apse [which governs the slow change in the Moon’s distance as it crosses the Equator] with the Synodic cycle (i.e the Moon’s phases) as well as with the seasons? 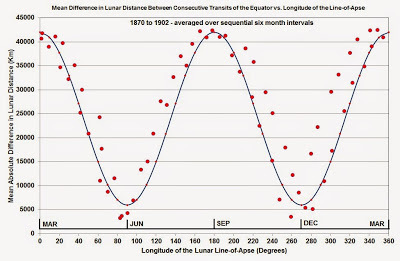 Figure 1 (below) shows the (mean) absolute difference in lunar distance between consecutive transits of the Earth’s equator, versus the (mean) longitude of the lunar line-of-apse. Each of the 65 data point in figure 1 represents a six month time interval, with the intervals arranged sequentially across a period that extends from June 1870 to Nov 1902. The 32 year time period chosen is assumed to be reasonably representative of the 149 year period of this study which extends from 1865 to 2014. Shown along the bottom of figure 1 are the months in which the longitude of the lunar line-of-apse points toward the Sun. This tells us that the line-of-apse points towards the Sun at the Equinoxes when its longitudes are 0 [March] and 180 [September] degrees, and it points towards the Sun at the Solstices when its longitudes are 90 [June] and 270 [December] degrees. Figure 1 (above) shows that if you were to randomly select a sample of six month time intervals during the years from 1865 to 2014, you would expect that they should (by and large) be evenly distributed along the sinusoidal shown in this plot. Figure 2 (below) shows the corresponding plot for all the El Nino events that are in the Full Moon epochs of the 31/62 year Perigee/Syzygy tidal cycle i.e. Hence,we can conclude that there is a highly significant difference between number of points within 45 degrees of the time where the lunar line-of-apse points towards the Sun at the Equinoxes, compared to the number of points within 45 degrees of the time where the lunar line-of-apse points towards the Sun at the Solstices. The difference is such that the El Nino events in the Full Moon epochs preferentially occur near times when the lunar line-of-apse points towards the Sun at the times of the Equinoxes. It is obvious, however, that the robustness of this claim of significance is not very strong, simply because of the small sample size. Indeed, it would only take two extra data points in the 45 deg. Solstices bin to render the result scientifically insignificant [i.e. a chi squared of 3.267 and a probability of rejecting the null hypothesis of 0.071]. Ideally, you would like to have at least double the sample size before you would be confident about the result. Figure 3 (below) shows the corresponding plot for all the El Nino events that are in the New Moon epochs of the 31/62 year Perigee/Syzygy tidal cycle i.e. This tells us that we are unable to reject the null hypothesis. However, the El Nino event that has a mean longitude for the lunar line-of-apse of 135.45 degrees in figure 3 could technically be placed in 45 deg. Solstices bin changing the chi squared to 3.769 and the probability of rejecting the null hypothesis to the scientifically significant value of p = 0.052. Hence,we can conclude that there is a marginally significant difference between number of points within 45 degrees of the time where the lunar line-of-apse points towards the Sun at the Equinoxes, compared to the number of points within 45 degrees of the time where the lunar line-of-apse points towards the Sun at the Solstices. The difference is such that the El Nino events in the New Moon epochs preferentially occur near times when the lunar line-of-apse points towards the Sun at the times of the Solstices. However, just like the El Nino events in the Full Moon epochs, it is obvious that the robustness of this claim of significance is not very strong, simply because of the small sample size. 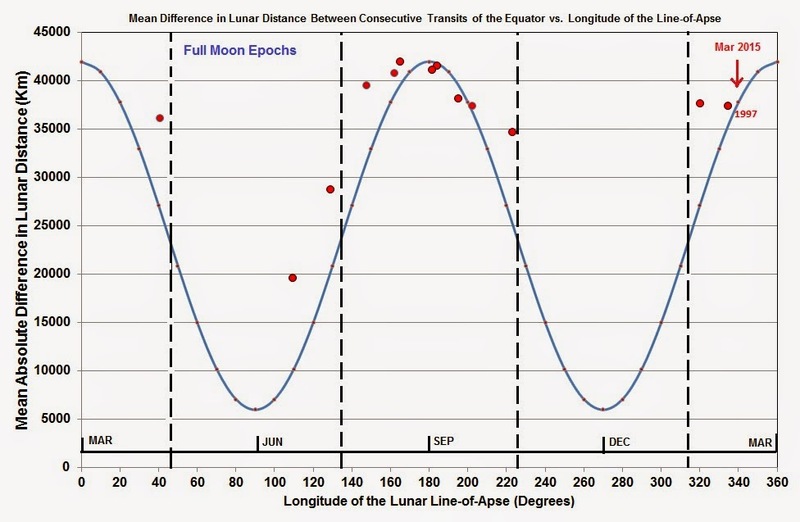 Comparing El Nino Events in the Full Moon Epochs with those in the New Moon Epochs. 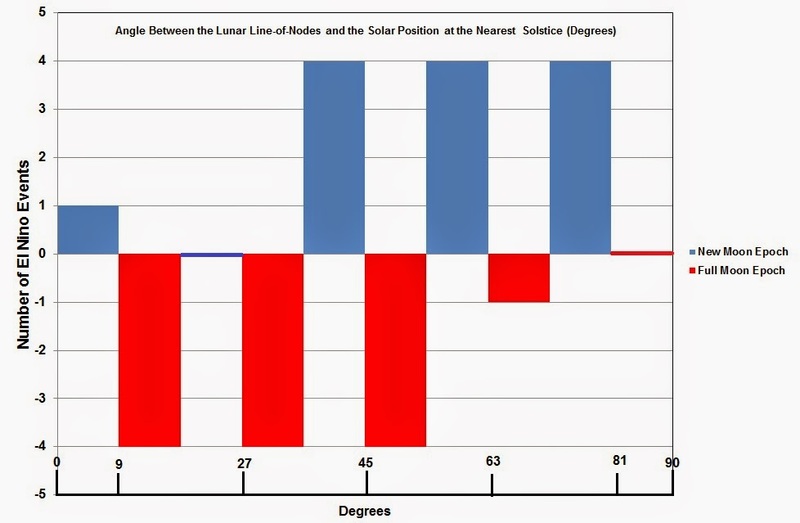 Figure 4 (below) shows a histogram of the angle between the lunar line-of-nodes and the Sun’s position at the nearest solstice for all of the 26 El Nino events in the study sample. This angle by definition lies between 0 and 90 degrees. The El Nino events have been divided into two sub-samples, consisting of those that are in the New Moon Epochs and those that are in the Full Moon epochs. The question is, are the angles between the lunar line-of-nodes and the Sun’s position at the nearest Solstice for the two sub-samples drawn from the same parent population (= null hypothesis). For a two-tailed solution this means that we reject the null hypothesis at the level of p = 0.002 – which is highly significant. 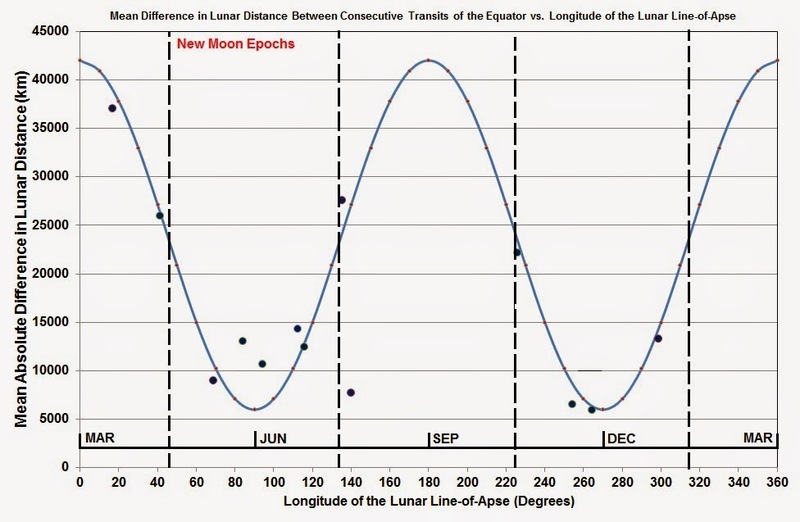 Hence, since we can say from our earlier results that: El Nino events in the Full Moon epochs preferentially occur near times when the lunar line-of-apse points towards the Sun at the times of the Equinoxes. We can now also say that: El Nino events in the New Moon epochs must preferentially avoid times when the lunar line-of-apse points towards the Sun at the Equinoxes. This study is still a work in progress but already we can make some interesting predictions, which if fulfilled would reinforce the claim that El Nino events are triggered by the Moon. Of there is always the caveat that we currently moving into an extended period of low solar activity which could reduce the the overall intensity of El Nino events out to at least the mid 2030’s. Lunar Cycles – 1999, Sanders, Prof. Emeritus Geology, Columbia Univ. Big thanks to Ian Wilson for his dedication to advancing our knowledge in the face of ignorance and uninformed opposition. Thanks also to Tim C for a nice formatting job on a big post. The moon may have some influence but solar trumps it. I like predictions let us see if it pans out. I will save this. Top heated water is an unstable stratified regime which is little researched. I have come across research where patterns just like the ocean effects would if presented as an article head graphic would fool readers into thinking it was real. Spontaneous eruptions are a feature. I point out that many systems exist where they are highly sensitive to tiny disturbances and whoosh. I raise the possibility that some of the big events are there because of a reduction in top heat from solar. This looks feasible during satellite era but less so before. This does not detract at all from Ian’s work, is additional, complementary. El Nino is synchronised with both Moon and Sun. If our solar planetary theory is correct, this means the Moon’s apsidal precession rate is influenced by other planets. It is noticeable that Ian’s 31.006yr period is close to being in a 1:3 ratio with the 10.38yr JEV period identified by Ray Tomes and independently determined by Ian himself in his earlier paper co-authored with Waite. It is also in a very approximate 3:1 ratio with the period of the Gleissberg cycle and approximate 6:1 ratio with the Jose cycle. This is indeed a courageous prediction (2015-2016 equinox), thank you Ian Wilson and team tallbloke. Chaeremon: Not necessarily at equinox. @tallbloke (November 15, 2014 at 6:14 pm) but Ian says so in his Final Comments. What do you mean? equinoxes (somehow near) in plural is O.K. for 2 years 2015-2016. Thank you Tim for pulling out all the stops and getting this post up. You are one of the unsung heroes of this ongoing adventure. Superb job! Thank you Rog for hosting a forum that is open to new and potentially interesting thoughts and ideas. It takes great courage to maintain an environment that allows people to safely question the supposedly sacrosanct scientific ideas of our times. # Salvatore Del Prete: The Sun is the driving engine of the El Nino. It heats the top few hundred meters of the Eastern Pacific ocean during La Nina events – recharges the energy in the battery that powers the next El Nino. 2015-2016 event will have potentially devastating effect all around the Pacific basin. the Earth that would re-fire the religious zeal of the true-belivers. It is interesting to note that the 9 year sequencing of El Nino events in the New Moon Epoch that ended around 1994 i.e. reappears as an El Nino event around 2009-10. Hence, it is possible for one or two El Ninos, that you would normally expect to occur in the New Moon tidal epoch, to linger into the following Full Moon tidal epoch (i.e from 1994 to 2025). sharper brain than my rusty old central processor. # Tim: Thank you for the historical article – The Lunar/planetary model has many pioneers. Do you really think we will have a “Strong” El Nino in 2015/16 with the Sun going quieter? Bloody hell and I always thought that strong El Nino events are triggered by climate scientists. IW: yes I was aware of the 93 year 3:5 split you referred to. At 1767 years there are 93 Metonic cycles and 95 x 18.6 years. Around 1768 years = 89 Jupiter-Saturn conjunctions. # Oldbrew: You’ll have to forgive me but this still fascinates me. The Metonic cycle is a commensurability between the synodic period (i.e. the relative movement of the Moon about the Earth with respect to the Sun) and the sidereal orbital period of the Earth about the Sun. In other words, the Moon does 254 orbits of the Earth with respect to the stars while the Earth does 19.0 orbits of the Sun with respect to the stars. cross the diagram once from left to right. of the lunar line-of-apse (the value on the x axis) towards the right. of a given canonical point (e.g. the march equinox which is at 0.0/360.0 degrees). It can’t be any more than +/- 1.0 years. Hence the 2015-2016 prediction. Yes, I know that X + Saros = virtually the same situation (plus a small shift) but not so for the line-of-apse and line-of-nodes. 10 x revolutions (line-of-nodes) = 21 x revolutions (line-of-apse) = 186 yrs (wrote this @oldbrew some time ago). Note that 7 is also factor, not just 3 and 5. This relation covers 6 times your 31 yrs cycle, and there is at least 1 month at both intervals ends where syzygy + nodes + apse + seasons are in same phase (i.e. near the same stellar station). This relation holds good for circa 1 millennium (until the 930th year) with 50 x LNC = 105 x LAC. Chaeremon: Courageous is fine. As I understand Ian’s proposition, the next notable El Nino will occur in 2015-2016, but not necessarily starting, finishing or peaking at an equinox. The equinox is just a marker which is used to ‘bin’ the data for analysis. Is that right Ian? Your 930yr cycle is of note. This is close to the period proposed by P.A. Semi as the primary period for the cycle of angular momentum in the solar system. If you have ever had the chance to watch “Yes Minister” and “Yes Prime Minister” you will get a good idea of English meaning of word “courageous” when it comes to decision making, particularly political decision making. However, I got your meaning and I’m encouraged that someone else has the fingers crossed for my 2015-2016 prediction as well. You make the important point that there is a 186 year cycle that governs the alignment of the lunar line-of-nodes and the lunar Perigee/Syzygy lunar cycle i.e. However, the 8.8506 year lunar line-of-apse cycle slowly drifts with respect to the above cycles. Yes you are correct – During the period covering the years 2015 and start of 2016, the slowly drifting lunar line-of-apse will be pointing at the Sun near the time of the March Equinox. It is during those years (and not necessarily at the time of March Equinox) that I predict the El Nino event will start. I corrected Ian’s typo. A while back I found a direct commensurability between one of the Moon’s evection anomalies and Jupiter’s orbit. I think the reason the Moon’s cycles don’t line up more exactly with Venus and Jupiter cycles is because it was perturbed by the cataclysm posited bt Tom van Flandern which occurred several million years ago. 987 x 5 synodic months = 399 years = 21 x 19. ‘At 1767 years there are 93 Metonic cycles and 95 x 18.6 years’ – earlier comment. That’s near-resonance with the solar system (both inner & outer). I’ve pointed this out countless times since Piers Corbyn first woke me up to this several years ago. It’s plain as day in annual aliases of the lunar nodal cycle via NASA Horizons. There seems to be a very strong progress-limiting resistance to broader awareness of this in the solar-climate discussion community. Thanks Paul. That sounds like a better solution. Meeus, J.; & Savoie, D. (1992). The history of the tropical year. Journal of the British Astronomical Association 102(1), 40-42. Very interesting study Ian, sorry if the translation is not good, but I’m Spanish and my English is not very good. I made NIÑO analysis from 1541 to the present, a total of 63 events NIÑO, based on degrees declination of the moon, and no NIÑO event has been present in the Central Pacific when the moon reaches its minimum declination will happen March 2015 and September 2015. It is, but during lunar declination minimum 18º’20 and 18º’14 is not favorable for the NIÑO circulate through the Central Pacific. Of the 63 events NIÑO I have analyzed, none have been present in the Pacific during these grades lunar declination. If you can develop events NIÑO 3 times of the 63 events that have analyzed, the year before the moon reaches those grades lunar declination. And you can also develop events NIÑO 4 times of the 63 events that I have analyzed, the year after the moon has gone from those degrees minimum lunar declination. Also no weak NIÑO event, as we have now, (November 16, 2014) has come to be in the month that the moon reaches its minimum declination. Moreover, if there is a high correlation during periods of peak Lunar declination, ie 28º’72 maximum declination is circulating in the Central Pacific NIÑO event. No I want to say to all this that his theory is correct, I will study it because it is very interesting. I hope you do not mind, my explanation is only part of the research I am conducting with ENSO NIÑO, and degrees of declination of the Moon. So I think in March 2015 and September 2015 will not have ENSO NIÑO in the Central Pacific. The beauty of a scientific hypothesis is that is must be compared with observational evidence. Thank you for sharing you alternative hypothesis with us. Time will tell if either of our ideas has any merit. should be very similar to the declination at 1997.33 + 18.60 years = 2015.93 – that should be in November- December next year. Thanks Ian, to accept that there may be alternative ideas. Ian As you say time will tell whether our theories can be successful, because his theory is on the line of the apses of the moon, and my theory is the degrees of the lunar declination. Which means they can be complementary theories. and day 24-05 – 1997 Moon was at – 18º’40 S.
On March 16, 1997 had reached its minimum declination 18º’14 N.
On March 26th 2015, the Moon will arrive at least a first decline 18º’24 N.
On 21 September 2015 the Moon will be at minimum declination 18º S ’14. To then up in the cycle. On 15 November 2015 the Moon will be at 18º ’34 S.
On November 27th 2015 the moon will be 18º’39 N.
I note that the data of May 1997 are almost the same as in November 2015, only 18.6 years have past, a Metonic cycle. And in May 1997 began a ENSO NIÑO event in the Central Pacific. Did you know that in the month of November 2015 we have another in the Central Pacific ENSO NIÑO Think? For grades coincide lunar declination of May 1997, which began ENSO NIÑO, and now we are in November 2015 in the same grades you can start another ENSO NIÑO … .. In fact there are ENSO NIÑO that began with the Moon 18º’39 but following the moon was at a low declination year. Not in the same year. It will be very interesting to observe how both investigations are ongoing. I can’t say that I’m impressed much. “El Nino event” doesn’t mean a lot because the Southern Oscillation Index is a continuous range or values and researchers have somewhat arbitrarily said that the SOI averaging above a certain SOI figure for a certain amount of time is labelled an El niNo event or, in the opposite direction, a La Nina event. It could well be that the ENSO would have fallen just short of one of these states and Lunar forces pulled it over the line, or that ENSO was just over the line and lunar forces made it a stronger, hence a “strong El nino event”. Wilson would probably be better to focus on the SOI value, either US or Troup, rather than some “event”. The US Multivariate ENSO Index (MEI) covers more elements than the Troup SOI which is based only on atmospheric pressure in two locations. Further, one has to be very careful, about what is cause and what is effect. Instead of assuming that winds drive ENSO conditions maybe look it as a pool of warm surface water that would cause convection and therefore cause certain winds. Is the wind really pushing the ocean water and piling it up in the western Pacific or it is that the western pacific is warm and the thermal expansion of water causes the local rise in sea level? Smith, C.A. and P. Sardeshmukh – The Effect of ENSO on the Intraseasonal Variance of Surface Temperature in Winter., International J. of Climatology, 2000, 20 1543-1557.
strong El Nino event [as measured by BOTH the SOI and Nino 3.4 indices] between 1865 and 2014. I have used the BEST index to delineate and El Nino event for the very reason that these events are part of a coupled oceanic and atmospheric phenomenon known as the ENSO. That’s not the MEI I know. Something’s wrong here. MEI subsumes the BEST described here and it’s not a proxy. Be aware that there are 2 MEIs. It appears we’ll have to be more careful with definitions to avoid misunderstandings. It’s easy to devise several MEIs beyond the 2 commonly mentioned in solar-climate discussions. There’s nothing official about the 2 commonly referenced MEIs. They were simply the 2 chosen to be shared by the author. An observation that one MEI or another has or does not have this or that feature does not necessarily extend to MEIs more generally. The officially sanctioned MEI’s (or Multivariate ENSO Indices) are an amalgam of various indicators of the ENSO state. The parameters that are chosen are designed to be sensitive to the presence of (generally agreed upon) El Nino conditions, as defined for the instrumental era. I agree with you 100 % and so I will clarify my comments. available prior to this date. All six indices are chosen because of their sensitivity in to ENSO like conditions to various degrees. The MEI implicitly assumes that the sensitivity of each of the indices remains the same over the period of time that is being considered. In reality, the sensitivity of these indices is calibrated upon the period between 1950 and 1993. Hence, by definition, the extended MEI is a PROXY extension of this assumption back to dates prior to 1950. My beef with the extended MEI – particular with the attempts by Gergis et al. to extend it prior to the start of sea-surface temperature and pressure records in the 1860’s and 1870’s. Even a cursory comparison with this extended Index shows huge disparities between what the MEI regards as as STRONG El Nino event and what the historical records show. This makes me tad suspicious of the extended MEI’s ability to determine the real (relative) strength of historical El Nino events prior to 1865. The main reason that I use the BEST Index rather than the extended MEI (post 1871), is the fact that the former is monthly, while the later is bi monthly. Given that I am trying to determine the starting point of historical El Nino events, the BEST gives the best time resolution for the problem at hand. Regardless of the Index you use, you still talk about ENSO events. As I said earlier, you shouldn’t talk in terms of such an artificial construct. You’d be better to refer to specific threshold values that you adopt for your discussion. Also, I see no issue with the possibility that Lunar forces have added to the situation. The LoD has been explored for years and the fact that the LoD increases with “bulging” ocean is nothing new. The late John Daly’s web site, still being updated I believe, has or had articles about it and its possible relationship to ENSO. I recently learnt a lesson of sampling .. You can get data matches that align and come to conclusions but as the time series extends these alignments can shift. within thresholds. How is the moon linked to PDO phases may l ask IAN? Wolter’s extended MEI is monthly resolution (12 per year) of bimonthly summaries and it’s not based on any assumptions about post-1950 but rather on observations (no proxy) of SST & SLP at the times recorded, so I conclude that some kind of misunderstanding remains at play in this discussion. Wolter’s “extended MEI” is technically a misnomer, as it’s not actually an extension of Wolter’s original MEI, but rather another MEI based on a subset of indices. The important thing to note as anyone develops dozens of MEIs from scratch is that they’re all basically the same because stuff’s coupled. I don’t have any issue with the index Ian chose, nor do I have any issues with Wolter’s seminal MEIs. Rather I’m encouraging everyone to develop dozens of MEIs independently from scratch as such an exercise encourages sober open perspective. I don’t regard any MEI as “official” and I don’t regard any agency as having the authority to declare any MEI as such. I should clarify that BEST is an MEI. December is often the peak of an ENSO event and l think April/May is the predictability marker for forecasts? The 8.85~ year lunar line of apse cycle lines up with 36 Jupiter-Mercury conjunctions. Every 240 J-Me takes just over 59 years (59.0011) and 59 x 6 = 354 years plus 2-3 days. Paul, I think we are in almost complete agreement on this. Thank you for your comments. Always good to hear from you. [Ian] I need more convincing that we are in an El nino dominant phase since 1994.
occur at or south of the Equator. occur at or north of the Equator. out that we have entered a ~ 30 year period (from 2000 to 2030) where the frequency/intensity of La Ninas dominated over El Ninos. It would appear that the boundaries that I have found for the Full and New Moon epochs are six years earlier (1970 –> 1964 where we enter a New Moon Epoch, 2000 –> 1994 where we enter a Full Moon epoch and 2030–> 2024 where again enter a New Moon Epoch). I think that the six year delay between a flip from a New to Full (or vice versa) epoch to a flip in the frequency of El Ninos and La Ninas may be just caused by the six thermal lag of the oceans. 1997-98 –> 2006 –>. 2015-16 –> 2024-25 with 2019-20 as a possible half cycle. First, welcome aboard John it always good to get the opinion of a respected pioneer in this field. You have done a considerable amount of work to highlight how the variation in the frequency and intensity of El Nino and La Nina events potentially influences the world’s mean temperature. Point taken – I think you will find that the rough equivalent is that for the 133 Januaries, the 133 Februaries, the 133 Marches, etc between 1871 and 2005, the extended MEI ranking for each of my El Nino events are those months in a particular year that are between the 105th and 133th strongest MEI index for that month. I am more interesting in determining the rough starting month of the El Nino event. lunar conditions that existed at the start of the event. and I am certainly being more specific when it comes to the prediction of these events. @Ian who wrote: I think that the six year delay between a flip from a New to Full (or vice versa) epoch to a flip in the frequency of El Ninos and La Ninas may be just caused by the six thermal lag of the oceans. The nodes and apse (revolving against each other) meet again every 6th year, that are 2190.34347 days mean. I think your observation of a physical phenomenon recurring at this rate deserves more attention, eg. if the oceanic lag you mentioned may rather be the effect. Ian already has certain bases covered here so rather than aiming to deliver duplication of services (an inefficient division of labor, which is in deathly short supply), I’ll resume exploration of NASA Horizons lunar patterns aiming to supply complementary observations. I began such exploration about a month ago but got sidetracked by curiosity about HL Tauri gap spacing. By the way I have a new HL Tauri gap spacing model beyond the last one I shared, but I’m not going to bother summarizing it as my interest is now drifting elsewhere and time will always be in too short supply to do everything. One thing I’ll probably do is graph the 6.4 year lunar pattern in NASA Horizons output, as I see this as something the community needs to face and acknowledge. It’s obvious that the majority of solar-climate commentators can’t even imagine it possible to get 6.4 from 18.6. Well, bluntly, this failure needs correction and less delay is better than more. If people keep failing on something this clear cut and simple, we might as well just close shop and take up new, completely unrelated hobbies. It’s a busy week, so it may take anywhere from a few days to a few weeks to organize appropriate graphics. of Earth’s north pole at the reference epoch. Geometric states/elements have no aberration corrections applied. As the chart sent by Weather Cycles suggest La Nina /cold PDO which has been more prevalent recently should continue to dominate going forward. The PDO if it stays in a cold phase should not make El Nino’s that common. annually aliases 2, 2, 3 pattern at 6.4 year spacing giving QBO/Chandler average. I’ll regard with suspicion anyone unwilling to acknowledge this. PV: the nodal period works out to 695 in 12936 years. 12936 = 1617y x 8 = 160000 lunations (rounded up). _________________________= 1.1852 years = 432.90 Sidereal days. The doubling is understandable since the minimum period, set by the 1.0 year sampling, is 2.0 years, and most of the power is at the 1.1852 year Chandler Wobble period. Hence, I presume that you are saying that an aliasing (or sampling) of a signal exhibiting a period equal to that of the Chandler Wobble (i.e. 1.1852 years) naturally links to a 6.4 year modulation period which in turn links the planetary synchronization period of 6.4 years. Of course, the signal (exhibiting a period equal to the Chandler Wobble) that you are referring to is the Z motion of the Moon with respect to the plane of the ecliptic. As a first approximation you might expect the Z motion of the long term motion of the Moon with respect to the plane of the ecliptic to be primarily dominated by the 18.6 year Draconic cycle. when it comes to a process (e.g. the Earth’s climate) that samples this wobble of the lunar orbit on a seasonal annual basis. Finally, is this the connection between 18.6 and 6.0 years that you are hinting at? Alert: The envelope has 6.4 (not 6.0) year period. I summarized Piers Corbyn’s insight on p.14 here when my solar-climate perception was in its relative infancy and then again later on p.5 here when my perception was approaching a state of relative lock down. It was my recent discovery of Fedorov’s work that inspired me to start systematically hunting through earth-moon aliasing patterns across all available NASA Horizons reference frames. During quick & dirty pilot exploration #1 a crystal clear 6.4 year envelope was easily evident, even to the naked eye. Ian, the annual physical aliasing is from the lunar draconic month (27.212221 day wave). Weakened solar activity increases both the intensity and frequency of El Nino episodes. You are correct about the El Nino intensity in low solar activity periods. Whoah! There’s that 1934 thing again! When will the curves go back into phase Paul? My instinct is that some of the literature focusing on 18.6 is using incorrect geometry (wrong reference frame &/or rotation frame) and that the correct geometry (for some key processes) is 12.8, 6.4, 2.37, 1.185. There are discrete changes in circulatory topology over the course of a terrestrial year. Hence there’s physical aliasing. Circulatory KNOTS are NOT FREE to sample lunar geometry in the same way in the same locations at all times of the terrestrial year. More attention to Knot Theory. There remain at least 2 more stages of tedious exploratory verification before I’ll elaborate much further. Genuine deep thanks for contributing as you do. The IPO spatial pattern narrative being pushed at wuwt is implicitly based on a patently false zero-sum assumption. It can be effortlessly verified that the spatial pattern cycle is coherent with an amplitude cycle. This is hardly surprising (duh!) given the confounding of the spatial pattern with equator-pole gradients. This is a serious error. These planetary synodics give a framework for the Chandler Wobble. Furuya & Chao paper confirms CW as 433.7 +/- 1.8 days. @Ian who wrote: … the time when the lunar line-of-nodes points at the Sun. Can you share what reference [calendar] date you use, TIA. OB, if you dig around you may find an article I once saw that tabulated CW periods estimated by various investigations. The period you’re citing is toward the high end of the spectrum. One thing to watch out for is estimates based on false assumptions. One of the standard inferential assumptions doesn’t hold for CW and most investigators don’t bother with diagnostics that reveal this. PV: are you sure it wasn’t this study i.e. the one I linked to? The lowest estimate was 433.0 days. In NASA Horizons documentation I shared above note carefully “01-01 […] Step=1 Y […] Jan-01 […] Step-size : 1 calendar years”, which physically aliases this pattern. 1. Polar motion was synchronized with December solstice draconic aliasing until WWI. 2. Then synchronization briefly tipped towards March equinox. 3. It then gently rocked back through December solstice before tipping very hard towards September equinox in the late 1920s and going right past that to eventually stabilize on June solstice by the mid-1930s. There’s so much more to say, but there’s never enough time. Due to the fluid & pulsating nature of atmospheric & oceanic circulatory orbits (including turbulent eddy diffusion) we have cause to consider topologically invariant measures of correlation at scales too local to be in phase with global limits. Conventional inference is encumbered by unrealistic assumptions about the properties of sampling aggregation across knot structures. Sensible exploration of unknown or vaguely known mesoscale boundaries demands sober consideration of knotting’s effect on aggregate correlation phase. The mainstream vanguard is mistaking the lunar knot for the solar whole. An order of magnitude more careful attention to sampling aggregation criteria could get them off their misdirected communications strategy (if their integrity isn’t compromised). Full knowledge of the lunar knot is desirable and perhaps in time the public will be more deeply indulged, but intimate knowledge of lunar knot details isn’t needed to see the solar whole. The notion of a topologically invariant measure of correlation should be all a sharp reader needs to take from knot theory to avoid being perpetually jerked around on a political yo-yo by ENSO. This study identifies the strongest Perigean spring tides that reoccur at roughly the same time in the seasonal calendar and shows how their repetition pattern, with respect to the tropical year, is closely synchronized with the 243 year transit cycle of Venus. It finds that whenever the pentagonal pattern for the inferior conjunctions of Venus and the Earth drifts through one of the nodes of Venus’ orbit, the 31/62 year Perigean spring tidal cycle simultaneously drifts through almost exactly the same days of the Gregorian year, over a period from 1 to 3000 A.D. Indeed, the drift of the 31/62 year tidal cycle with respect to the Gregorian calendar almost perfectly matches the expected long-term drift between the Gregorian calendar and the tropical year. b)	the 243 year drift-cycle of the strongest seasonal peak tides on the Earth (i.e. the 31/62 Perigean spring tidal cycle) with respect to the tropical year is approximately equal to −7 ± 11 hours, over the 3000 year period. The large relative error of the final value for the residual drift means that this study cannot rule out the possibility that there is no long-term residual drift between the two cycles i.e. the two cycles are in perfect synchronization over the 3000 year period. However, the most likely result is a long-term residual drift of −7 hours, over the time frame considered. Ian: You can also cycle the annual aliasing pattern by rolling the start date on a 13.6061105 day cycle. This gives the other compact basis for exploring local circulatory decoherence from global entanglement. I’ve expressed this in a different way the past: It’s a balanced multi-axial differential, so there’s actually no paradox despite common misinterpretations incorrectly suggesting so. I believe the wuwt campaign to be founded (some may say masterminded) on the premise that the average reader will be naturally quite strongly inclined towards the perspective of the “local realist” even though aggregate constraints patently rule out that possibility. It’s a clever strategy in a democracy, but it’s weakness is that it can’t fool those with the capacity to think thoroughly through the philosophical implications of aggregate constraints from the laws of large numbers & conservation of angular momentum. Some parts of this note may make more sense in hindsight at some later date, but hopefully the first 3 sentences will make sense immediately. Best Regards. Ian, I’m well-aware of how to derive the calendar drift cycles firsthand. If you think I’m dismissing the possibility of a lunar role in terrestrial climate then we’re having a (rather substantial) misunderstanding. I’m confident that any such misunderstandings will fade in time. The moon’s a crystal shaping symmetries of solar aggregation, so I would hardly recommend ignorance of its relatively simple properties (which are actually immensely — if not impossibly — complex to most people). I look forward to ongoing exploration & discussion as the weeks, months, & years unfold. 84% of high-frequency daily LOD variation is due to the lunar tropical month. 91% is due to the combination of the lunar tropical month & the lunar draconic month. Extending the combination to include the lunar anomalistic month increases cumulative accounting to 96%. The role of the anomalistic month is outgunned 17:1. The 62 year perigee-syzygy-season event isn’t a foundation of a repeating cycle. (Alternatively it’s a cycle that slips after the first cycle. For example, there’s no event at 186.) However, the 31 year (2/3)(node-syzygy)-season events form the basis of an enduring cycle that’s evident out beyond 186 and only gradually weakening without even slipping. Perhaps nodes deserve most of the attention directed towards perigee. The most significant variation in any monthly period is a pronounced peak in LOD (minus the seasonal trend in LOD) of roughly 1 milli-second, that lasts for a couple of days that are centered on or about the date that the Moon crosses the Equator [see my first post]. The size of these peaks in LOD (minus the seasonal trend in LOD) is directly dependent on the distance of the Moon from the Earth at the time of passage. The reason? Because these peaks in LOD (i.e. slow downs in the Earth’s rotation rate) are cause by the peak of the lunar tidal bulge being dragged across the Equator. This is the reality. You needed to square this with the statement above to be believable. The spacing of the spikes in LOD are the aliasing element with respect to the seasonal calendar (i.e. tropical year) and so that’s why the tropical month dominates the variance in LOD. If the spacing (or possibly the variation in spacing) is the dominant factor in forcing the climate then the beating of the tropical month with the tropical year will come into play. However, if the magnitude of the LOD spikes, or the relative magnitude of consecutive LOD spikes is the more important factor when it comes to climate then the beating of the anomalistic and draconic lunar months with the tropical year will be a more important factor. Apologies. I’ve figured out how to hit an enduring 31 year perigee pattern using thirds. Perhaps the nodes account for high amplitude 2.37 year variation while distance accounts for 4.5 year variation. Note that 2.37 is nearly a harmonic of half-year aliasing of 9.3 at 9.5 and 4.5 is a harmonic of annual aliasing of 8.85 at 9. It makes intuitive sense that aliased perigee would be a mild amplifier of aliased nodal timing. Someone with a substantial amount of free time could probably build a simple model of this using NASA Horizons output in a single long sitting. I wouldn’t be surprised if NASA JPL already has a classified model of this. One important concern I’ll raise is confounding of the epochs with solar cycle deceleration. Thanks Ian for giving cause to explore lunar scrambling of solar pattern in increasing depth. Good point. I will send you a copy of my paper that highlights this very feature. This gave cause to check and I found by far the tightest low-integer-fractional alignment at 31 year spacing for tropical half-year beats with the lunar tropical month and in second place — also very tight — tropical half-year beats with the lunar draconic month. I had already been planning to look into semi-annual aliasing of Horizons output, so here’s another reason. I’m making little attempt to be precise with words here since there aren’t enough hours away from paid work to facilitate that — apologies for any related miscommunications. I made an effort above to be more tight with some of the language surrounding the graph and Horizons documentation I shared. That stuff is rock solid. The stuff I’m adding later in the thread is basically live-streaming exploration of Ian’s focus on 31/62 pattern, with all of the associated messiness left unfiltered to help keep a conversation about an interesting topic going. I’m not yet convinced that 31/62 is important, but I’m at least getting a lock-down on where it comes from. And who knows where the subconscious mind leads from there following a few sleeps and exposure to (and recombination with) other information. I’m developing graphical tools that dramatically simplify all of this. With the tools I easily pick out all of the events Ian mentions in a single easy glance. I’m going to strongly suggest to the community that such visual simplification of event series is necessary. Otherwise discussion of event series is far too much of a mess. There’s plenty of scope to extend, refine, and customize the simple tools I’m building. If time permitted completion the aim would be to effortlessly tell whole stories on a single page including a graph telling the whole story all by itself to people with the right background. I’m leaving commentary there for now. Perhaps discussion will resume when Ian’s paper is released. I’ve refined a prototype visualization tool to the point where it perfectly verifies theory. Ian: If you can spare a minute to save me time hunting the net for astronomy definitions, could you generously crystallize how these 2 groups of measurements differ technically? I’ve got a rigid lock-down on the timing aspect of this, but I need to develop a lock-down on astronomy definitions. I’ll refrain from elaborating on the timing aspect until your Venus-Moon paper is released. The elliptical orbit of a body about another (usually much) larger body evolves with time. 1. Periapsis distance: The point of least distance of the orbit of a celestial body from its center of gravitational attraction. 2. Apoapsis distance: The point of greatest distance of the orbit of a celestial body from its center of gravitational attraction. The Earth-Moon system is subject to the slowly changing outside gravitational force of the Sun which slowly changes the shape of the lunar orbit about, depending on the orientation of the lunar line-of-apse with respect to the Earth-Sun line. The slowly changing shape of the lunar orbit is called Evection e.g. this process can led to a change in the perigee distance of the Moon from 356,400 km to about 370,000 km, over a 8.85 year period for a given location in the Earth’s orbit. Hence, for such a system you need to know the Periapsis distance, Apoapsis distance and eccentricity at each step in time. Thus, if you choose a geocentric co-ordinate system, QR and AD should be exactly the same as RG (Range) but only at the precise times of Perigee and Apogee. At al other times RG should vary between these two extremes. Ian: Thanks for clarifying the comparative differences of the JPL Horizons variables. There’s much to discuss and I’m a firm believer that cumulative delays of administrative origin can reduce by orders of magnitude how much we achieve in life, but out of genuine respect for differing priorities & perspectives, I choose to refrain from commenting further on 26.72660385 years, 121.5537289 years, & 30.02778018 years until Ian’s Venus-Moon paper is officially released. 71% of high-frequency daily LOD variation is due to the lunar tropical month. 82% is due to the combination of the lunar tropical month & the lunar draconic month. Extending the combination to include the lunar anomalistic month increases cumulative accounting to 93%. The role of the anomalistic month is outgunned 8:1. The video linked here is a talkshop must-watch. So there are exactly 7.85 FMC in 8.85 years = one FMC less than the number of Earth orbits. Note: 540 Saros cycles = 9736 years — exactly one more year. Joe Bastardi of Weatherbell ‘s prediction. I think Joe Bastardi will be correct. Thanks Salvatore, I’ll put that on the predictions page.